It’s been a busy year for water managers in the seven states that rely on the Colorado River. Luke Runyon is a reporter with KUNC who covers on the Colorado River Basin. AZPM’s Ariana Brocious chatted with Luke Runyon to recap what’s been happening and why it’s so important. RUNYON: Late last year the federal government told state water leaders throughout the Colorado River basin that they needed to get a plan in place to deal with water scarcity. And they’ve been working on these drought contingency plans for years now. The feds said basically that they needed to hurry up and get them done. So this whole year during 2018, there’ve been these really tough discussions happening in places like Arizona, Colorado, California to figure out how to better deal with this gap that exists between water supplies and demand on the river. And to top it all off, it ended up being one of the hottest and driest years on record in parts of the basin, which just further underlined the need for a plan to deal with that new reality in the Southwest. AZPM: While most of the other states have signed on to that new plan, Arizona has been a holdout. What’s different here than other states, if anything? Are our statewide issues more complicated or are we just having a harder time reaching consensus? RUNYON: Arizona has always had a reputation for doing things a little bit differently in the basin. And it hasn’t always worked out for them throughout history. Because of some of those past decisions on the river, Arizona really has the most to lose when it comes to water deliveries from the river. You have the state’s biggest water project, the Central Arizona Project, and it’s one of the most junior users on the entire river. So the water leaders in Arizona are having to come to terms with the fact that they’re going to be getting less water in the future. AZPM: Farmers in Pinal County have been especially outspoken about their concerns of losing water. Do they, and other water users, need to adjust to a future with less water and these cutbacks? RUNYON: Pinal County farmers draw water from both the CAP and groundwater which exists underneath their farms. Under current rules that manage the Colorado River, Pinal farmers are going to be the first in line to take big cuts to their river water. So they really see this discussion as one about their survival. The big discussion in Arizona is how do we make these cuts fair for everyone involved, and that’s a really hard thing to do. The fact is that somebody’s going to have to use less water. And figuring out who that is and when that is is a hot political discussion taking place right now in the state. AZPM: Water managers were supposed to finish drought contingency plans by the end of the year. As it looks now, they’ll miss that deadline. If the states fail to do their job, the federal government could step in. Any idea what that would that look like? RUNYON: At a water conference in Las Vegas a few weeks ago, the commissioner for the Bureau of Reclamation Brenda Burman gave the states until January 31st to get these plans done. And that’s a hard deadline. Burman said if the states miss that deadline then they’ll file a notice in the federal register which asks for specific recommendations on how to deal with these shortages. Then they’ll take all those recommendations from the state and come up with some sort of strategy. But this is something that water leaders in the West absolutely do not want. They don’t want the federal government meddling in their affairs. This threat is a hammer the federal government can wield every now and then to knock these big water deals across the finish line. AZPM: Looking to the future with increased stress on the river from climate change, what can we expect? Will agriculture suffer more than cities? When will these water supply concerns really hit home for people in urban centers like Tucson and Phoenix? RUNYON: I think it’s really hard to say. We’re already starting to see some innovation in doing short-term lease agreements between cities and farmers so that cities don’t end up gobbling up all the agricultural water rights in the region. They’re adding some more flexibility in. I don’t think people should worry about their taps being turned of in places like Tucson and Phoenix, that’s not really in the cards just yet. Really, the eyes are turning towards agriculture in the Southwest. And a lot of it is just a numbers game. 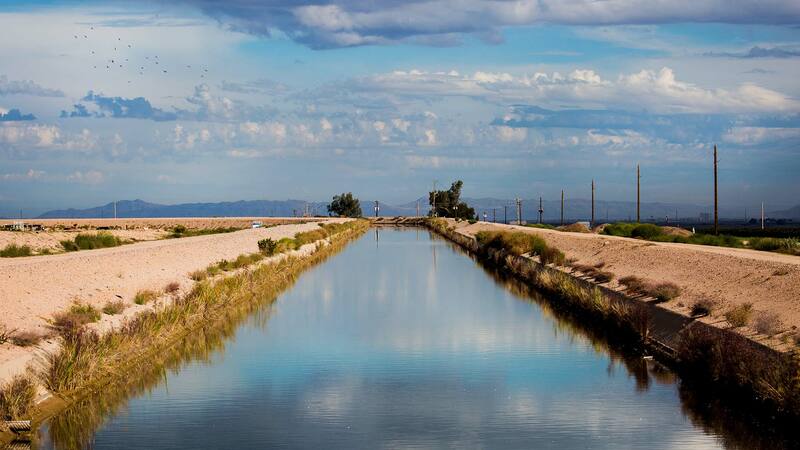 Agriculture uses about 80 percent of the water from the Colorado River, so if you’re starting to look at places that need to take cuts and how much water they’re using, that’s the biggest piece of the pie. But who suffers more? I really don’t know. It could be that over the years as things get hotter and drier you could see an economic shift in places like Arizona and California where you have more water moving from farms to cities. But there’s a lot of people trying to make sure that doesn’t happen, and if it does, that those rural economies don’t suffer because of it.